"Let it be known, sons and daughters, that Satan was an acid-head. Drink from his cup." 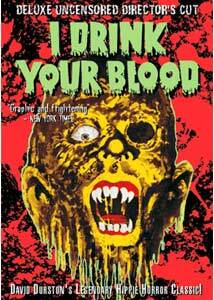 If you believe writer/director David E. Durston, the 1971 drive-in classic I Drink Your Blood has a history almost as interesting as the film itself, as it was supposedly the first picture that was rated X for violence. Whether that's 100% true or not is really irrelevant, because the film remains as an occasionally disturbing and dementedly enjoyable Charles Manson-era exploitation gore flick about a roving band of Satanic hippies who set up temporary camp in the small town of Valley Hills, with the expected horrific results. The hippie/devil cult is led by long-haired nasty Horace Bones, played here by celebrated Indian dancer Bhaskar, who despite a long-career in dance really established himself in the exploitation genre with this role as a menacing Manson-esque villain. Horace Bones and his faithful followers—in between rat hunts and murdering one of their own—make the major mistake of beating up and feeding some LSD to kindly old veterinarian Doc Banner (Richard Bowler), which prompts the doc's ten-year-old grandson Pete (Riley Mills) to exact revenge by injecting the group's meat pies with blood from a rabid dog. It is a pretty ingenious plan for a kid to concoct, and maybe not thought out to the nth degree—a little dose of hydrophobia goes along way as the intruding Satanic thugs become even more psychotic and murderous. Forget hunky Jack Damon as the requisite squared-jawed hero (he's a dam builder! ), I Drink Your Blood is really a wonderful character duel between Bhaskar chewing up the scenery as the just plain deadly Horace Bones and young Riley Mills as Pete, the stern-faced boy with the syringe full of rabid dog blood and a tray full of piping hot meat pies. It should be expected that Bhaskar would own the moment as the head baddie—and he is in pure Manson mode here—but Mills delivers on the other end by playing one brave kid, a shotgun-toting youngster who not only fends off the cleavage-induced advances of one of the female cultists, but comes up with the whole rabies/meat pie plan on his own. Durston was frequently at odds with producer Jerry Gross over the allowed levels of camp and comedy in what was supposed to be strictly a horror film, and somehow the two were able to create something that offered up a fair amount of dry humor as well as a troupe of believable Satanic cultists that were effectively evil, threatening and very dangerous. Even if the second half of the film falters just a bit as they go on their marauding, hydrophobia-induced rage, the first half shows the hippie cult as being realistically creepy and dangerous, and no doubt was even more so at the time of its release, with the reality of the Manson killings still fresh in the minds of the public. I Drink Your Blood was subject to an array of discretionary cuts by individual projectionists during its theatrical run in 1971, which according Durston resulted in approximately 280 different prints of the film in circulation at the time. This MTI/Fangoria release is the original uncensored director's cut, and for fans that is indeed a very, very good thing. Image Transfer Review: Considering the low-budget roots of Durston's film, the full-frame transfer offered up by MTI is impressive all these years later. There are all of the expected age-related issues like grain, nicks or specking, but the color reproduction is largely bright and suprisingly vivid. Fleshtones do run a bit red from time to time, along with some noticeable fluctuations, but overall a very nice-looking transfer for an early 1970s horror film. Audio Transfer Review: Audio is presented in its original mono, and the mix is extremely efficient. Dialogue and the shrill psychedilic synth score sound decent enough, though there is some minor clipping on louder sequences. Extras Review: Aside from a rather annoying menu structure, there is a healthy batch of supplements here, kicking off with a rich commentary track from writert/director David E. Durston and star Bhaskar (who passed away in late 2003, not long after this track was recorded). Durston is the centerpiece, full of effusive remembrances on what was intended as the "horror film to outdo all horror films", and his recollections are as fresh as if I Drink Your Blood was shot last year. The ins-and-outs of rat wrangling, a dog who could hold its breath for 40 seconds and Durston's ex-devil cult pal who helped pen some of the dialogue are just bits of the material covered, but one of the greatest bits comes from Bhaskar, who mentions how he intentionally spooked ten-year-old co-star Riley Mills by staying in character all the time as the evil Horace Bones. The I Drink Your Blood Show (28m:50s) features Durston, bloody mary in hand, presiding over four separate modern day interview segments with people involved in the film. Lynn Lowry, who played the mute girl, is someone Durston obviously has a soft spot for, and he speaks of how he created the role for her after seeing her, even if it meant no time to rewrite or add any dialogue for her character. Tyde Kierny (Andy) and Jack Damon (Roger) also get their moment in the sun, as does Barney Cohen, an ad exex whose behind-the-scenes role in part involved facilitating the name change that drove Durston nuts. Fun stuff, dished up with the kind of nostalgic exuberance usually seen for more mainstream titles. An automated Still Gallery (07m:06s), with optional Durston commentary, breaks down a huge pile of promotional images, broken down into Production Stills, Cast and Advertising categories. Things wrap with filmographies (Durston, Bhaskar, Lynn Lowry, Jerry Gross), a large set of exploitation trailers, and for a film that runs under 90 minutes, the disc is cut into a staggering 50 chapters. Here's one of the more infamous of the early 1970s underground horror flicks, a bloody, Satanic good time from writer/director David E. Durston. This is a hearty recommendation for genre buffs.